6waves’ new match-three puzzle game Fish Epic is off to a great start on Facebook, climbing to over 500,000 monthly active users (MAU) since it launched last December. 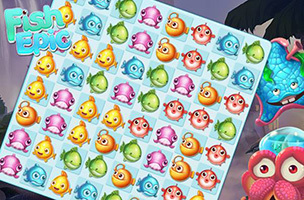 The game challenges players to complete levels by making matches with colorful fish to finish tasks, like collecting a certain number of fish in a single stage. Making matches of four or more like-colored fish causes power-ups to appear on the board, which are capable of clearing whole rows or columns of fish, adding them to the collected total. Players earn up to three stars on each level, depending on their final score, and can compare those scores with friends on level-specific leaderboards. As players make progress, they’ll unlock additional power-ups like bonus moves, which are activated at the beginning of stages. Plus, a whole set of power-ups becomes available in the middle of stages, helping players clear one symbol from the board, clear every fish in one row and column, change the color of existing fish and more. A lives system limits the length of a single gameplay session, but players can purchase additional lives, free and premium currency with real money. Fish Epic is available to play for free on Facebook. Check back soon to follow Fish Epic on AppData, our tracking platform for mobile and social apps and developers.